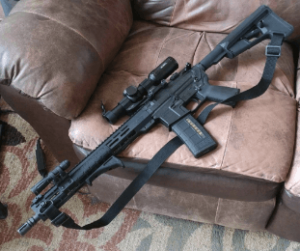 My Primary Arms 1-6 Review – The Best 1-6×24 Scope? The aim of the manufacturer; Primary Arms is to offer excellent quality scopes to each and every customer, professional, or to people who are into shooting. In line with this, Primary Arms also envisions to have a high-class customer service, providing products to consumers at reasonable prices. Through time, as the need for optics arises, They ensure that the products they make are still at their best. With the changing technology, improvements are being done to adapt to the newest and more efficient scopes to meet the demands of the customers. This time, I’m going to take a closer look on their 1-6×24 scope. In the end, you can decide if it’s something for you. This scope is both for professionals and personal enthusiasts who would like to add/replace the optics of their rifles. Click here to check for the lowest price. This riflescope has advanced combined sighting system reticle (ACSS), Try to remember this to the end of the article 😉 ! Basically it’s a series of fine lines on the eyepiece which is very useful in scaling objects at sight. This ACSS is patented by Primary Arms, and is on the second focal plane scope. Additional features include range estimator, holdover, wind drift correction, bullet drop compensation, as well as moving target leads. These substensions are correct up to 300 to 800 yards. The size of the second focal place reticle does not change size to facilitate proper scaling of objects at sight. The scope can also magnify from 1 to 6 times. There are 11 settings to adjust the lighting to correspond to the surroundings, from low light to daylight. The glass of the scope is very clear and there is an ease in targeting from a distance. One customer mentioned that the illumination was dim even in full daylight level. But who needs illumination in daylight right? Question: I am a newbie in the sports of shooting. 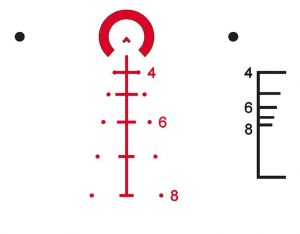 Can you tell me the meaning of the first and the second focal place reticles and their use to the rifle scopes? Answer: The use of the second focal plane in the scope as featured in this product is that the reticle does not change in size. This means that even though the magnification changes, the size of the reticle will not enlarge or be smaller. Unlike the reticles of the second focal plane, the reticles of the first focal plane is accurate over the range of the magnification, from 1X to 6X. The second focal plane is only accurate at the highest magnification, 6X. Question: Can you tell me how the newest generation, Gen III, differs from the Gen II? Answer: The Generation III is relatively shorter of 18 mm than the Gen II. It also weighs less of 1.88 ounce. In addition, the elevation, as well as the windage has an increased 10 MOA adjustments. The FOV of the Gen III is also broader. On top of that, the warranty of the Gen III is lifetime. Question: I’m concerned about the battery of the scope. How much time does it take for the batteries to die? Answer: It depends on the setting. For example, if you are using a medium setting, the battery persists for as long as 250 hours before it goes completely empty. Question: I would just ask if anybody else has experienced this. My problem is about the reticles, they become unclear. Do you have problems regarding the sharpness of reticles? Answer: While not being illuminated, the reticles of the scope are sharp. But when you start adjusting the lighting or the brightness level according to your will, some of the reticles will not be as sharp as they were before. It really depends on how you would like use it, because this rifle scope is good enough for combat. The reticles can be changed fast enough for moving targets. I suggest that if you want to have more sensitive reticles, try one with fine reticle lines. Question: I am wondering if this scope is water proof. Also, is it shock proof? There seems to be no information about that. Answer: As far as I know, this rifle scope is water proof. But, I wouldn’t be swimming with it ;). It is shockproof. Question: If the rifle scope is water proof, what is its IPX rating? Also, how long could you used it while being submerged in water? Answer: Primary Arms 1-6x24mm SFP Riflescope has an IP67 rating, which means it is fully protected from dust. This rating also means that the scope can be submerged in water 1 meter deep for half an hour. Question: While the rifle scope sights are in mounted on the rifle, what can I use as a mount on the ground? Answer: It depends on the Back up Iron Sight (BUIS) you are using. But in general, the use of mount that has a central height of around one and a half inch will do the work. Do you still remember the special feature I mentioned at the beginning of this article? Well it has that which is a great bonus to the already good scope. This rifle scope clearly has an excellent quality from its very clear glass, 11 illumination settings, accuracy of up to 800 yards, and its 1 to 6 times magnification. In addition, it is water proof and shock proof. 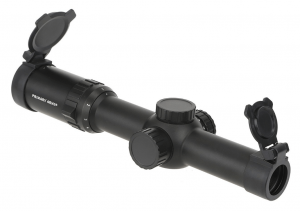 All in all, this rifle scope is helpful both for professional shooters and personal enthusiasts. And i almost forgot, it has lifetime warranty! If you would like to know it’s price and read some more reviews you can click here to go to the amazon listing.